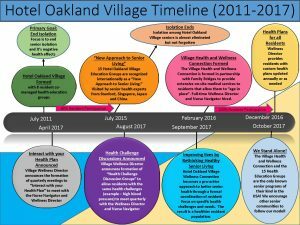 Hotel Oakland Village Timeline from 2011-2017! Please click here to see the Hotel Oakland Village growth over the past seven years! We’re excited to share the evolution of the Village – the only known senior program of its kind in the USA! ← Success Story of a 103-year-old Village Resident!